OPEN YOUR LIBRARY FOR CHANGE BY ADVOCATING FOR RESEARCH4LIFE! Research for Development and Innovation (through ARDI programme). HAVE YOU HEARD ABOUT RESEARCH4LIFE? Research4Life - started with the launching of Hinari in 2001 - is a public-private partnership of the Food and Agriculture Organization of the United Nations (FAO), the World Health Organization (WHO), the United Nations Environment Programme (UNEP), the World Intellectual Property Organization (WIPO), the International Labour Organization (ILO), Cornell University Library, Yale University Library, the International Association of Scientific, Technical & Medical Publishers (STM) and a wide array of international scientific publishers. Research4Life is designed to reduce the knowledge gap between higher and lower-income countries by providing affordable access to critical scientific and professional research (tens of thousands of leading journals, e-books, databases, publications) from leading academic publishers. In this way, Research4Life aims to enhance the scholarship, teaching, research, training and policy-making of the many thousands of students, researchers and specialists in the developing countries. 2. you can register your institution to all Research4Life programmes and get Institutional login to multiple Research4Life programmes (check eligibility criteria). Thanks to Research4Life programmes, interested parties from more than 8,900 institutions in more than 120 low and middle-income countries have been provided with access to up 90,000 quality online research resources which help foster and advance their knowledge, skills and career! A librarian in Myanmar to modernize the way of delivering literature to students. A physiotherapist in Ethiopia to finding better ways to treat his patients. A researcher in Zimbabwe to tackle the burden of diabetes. 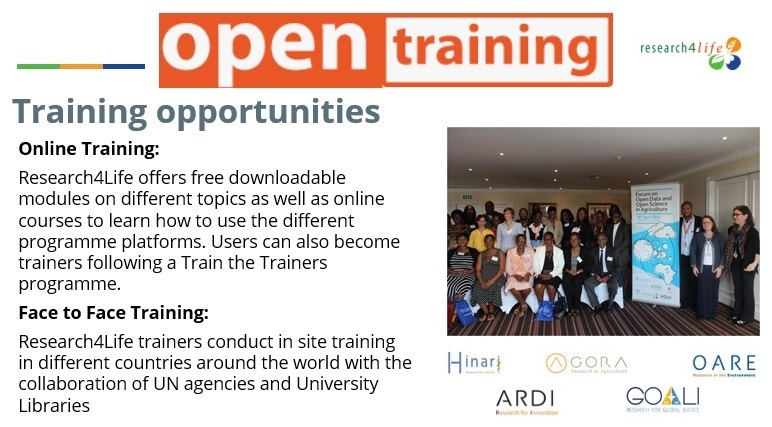 To help your institution, in particular librarians and researchers, to make the best use of Research4Life’s resources, the importance of training open to all interested parties and effective promotion of the programmes are the core values of Research4Life. Research4Life programme managers are committed to provide you with appropriate long-term support on the use of open online training materials and related activities. The content is aimed at librarians, information specialists, scientists, researchers and students, and is licensed under a Creative Commons (CC) Attribution-ShareAlike 4.0 International License. You are invited to access, download and share Research4Life training materials for free under the terms of the above-mentioned licence. In February 2019, Research4Life published its Advocacy Toolkit to help librarians and information professionals better advocate what their library is and does. Through its guidebook with exercises and a presentation that you can customize according to your institution’s needs, the Research4Life Advocacy Toolkit leads information professionals out of the library and into a community where services and resources can be promoted and marketed, and where partners, stakeholders and supporters can be found. professional development should be enhanced by following an OPEN COURSE or training that will also benefit other multiple efforts for advocacy. These will help you develop and follow effective strategies to advocate your library and enhance the use of its resources! It is important that all efforts underpinned to advocate your library ,through ‘getting the message across’, can be followed-up in a planned manner with specific goals, objectives and tools. You need to set up a timeline and assess the resources you already have, and those you will need. You are invited to ↓ Download the Research4Life Advocacy Toolkit (.pdf, 384 KB) and use it to facilitate implementation of activities that can help obtain support to foster the use of the Research4Life programmes in your institution! For more marketing material to promote your library and access to Research4Life peer-reviewed resources in your institution, you are invited to check out Research4Life Marketing Strategies open training session including also Research4Life Advocacy Toolkit. All resources are licensed under a Creative Commons Attribution-ShareAlike 4.0 International License. For more information about Research4Life, follow @R4LPartnership on Twitter, “Research4Life” on Facebook or subscribe to the Research4Life news directly on the website. The six steps listed by the Research4Life Advocacy Toolkit have been supported by the AGORA (Access to Global Online Research in Agriculture) programme, which has the specific goal to promote affordable access (in Research4Life eligible countries; Group A, Group B) to critical scientific research in agriculture and related sciences through the AGORA Content Portal. >> You can now get Full-Text content via Research4Life/AGORA enhanced with new Country-Specific Search in Summon! Several times a year the AGORA Team organizes free AGORA Workshops in different parts of the world, and conducts the free AGORA Online Course : Fundamentals of Information Literacy and Access to Global Online Research in Agriculture followed by hundreds of researchers, students and information managers. A programme manager of the Hinari programme answers some questions. We are grateful if you can share this Newsletter with your networks… And, Happy Open Education Week‏ - @OEWeek - #OEWeek 2019! (1) Become AIMS member (2) Sign up (3) click ‘My Page’ (4) click ‘Manage my subscriptions’ (4) check on topics of your interest. The scope of the AIMS Newsletter is to place attention on the AIMS community recent news, events and achievements in Open Access, Open Data, Open Science through dialogue, capacity development, collaboration and diversity, - in this way science can be advanced much faster, addressing the SDGs (Sustainable Development Goals).